Lying down with Stax phones 2. 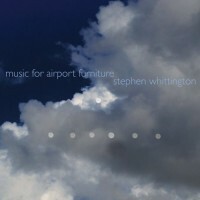 Stephen WHITTINGTON: Music for Airport Furniture (2011). Zephyr Quartet: Belinda Gehlert, Emily Tulloch (vlns), Jason Thomas (vla), Hilary Kleinig (vlc). Cold Blue CB0038 (http://www.coldbluemusic.com/). Stephen Whittington’s title must refer to Satie’s musique d’ameublement (Furniture Music, coined in 1917) and Eno’s Music for Airports (1978), but he turns them inside out – an exploration of inner states. Some have detected hints of Feldman or Scelsi. I don’t “see yonder cloud that’s almost in shape of a camel,” but Whittington did perform a celebrated live Triadic Memories in 1998. Cold Blue likes CD singles – this one covers considerable ground over its 22:47 length. Unhurried chords disclose the foundation, then the haze slowly and subtly clears as each voice finds itself. (Special praise to Jason Thomas’ viola.) Melancholy gains force – until a break at 12:50 resets focus. What follows is only briefly energetic. Isolated figures take over (15:40); the soaring violin is reduced to a squeak. After that, the group’s unison has a resigned aspect. The ending isn’t abrupt – no drama. The Zephyr Quartet (Adelaide-based, like the composer) boasts the required impeccable surfaces and rock-solid intonation. A budget Apex (2564 60239-2, 2004) has several musique d’ameublement works. Rec. in 1980 for Erato by Marius Constant and Ensemble Ars Nova.